What do we mean by "multiscale" and "non-continuum" flows? What do we mean by “multiscale” and “non-continuum” flows? Duncan Lockerby and I are leading a “Special Interest Group” (SIG) within the EPSRC-funded UK Fluids Network. The name of this SIG is “Multiscale and Non-Continuum Flows”. In practice, this means we are funded to arrange two meetings annually, for the next three years, to bring together UK researchers in multiscale and non-continuum flows with the aim of building links among the community that lead to joint projects in the future. Duncan and I both work on theoretical and numerical fluid dynamics, so we are very aware that in these SIG meetings we need to link with experimentalists and industrialists too. Instead, I found that this SIG meeting gave me the opportunity to think about what we actually mean by “multiscale” and “non-continuum” in the context of flows – and how this may be different from how other fluid dynamicists understand the terms. After all, in order to explain our work to others, we need to agree on and be clear in our own use of language. So I thought I would jot down in this blog some general ideas from my perspective, which could form the basis for discussion. 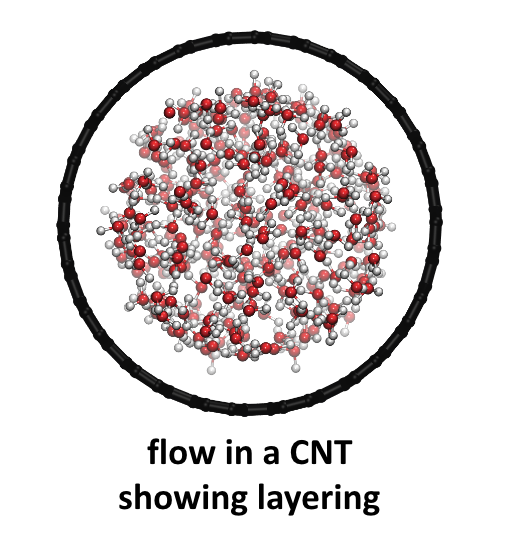 In non-continuum flows there are not enough discrete fluid material elements, i.e. particles or molecules, for a fluid element (that is small compared to the scale of the process) to be assumed continuous and indefinitely divisible. While the mathematical models of continuum fluid mechanics may therefore not be applicable, the language of fluid mechanics can still in some cases provide us with a useful shorthand that highlights the key challenges in the physics of these flows. What do I mean by this? For instance, the “enhancement factor” is frequently used to describe the performance of nanotubes in membrane-type applications. 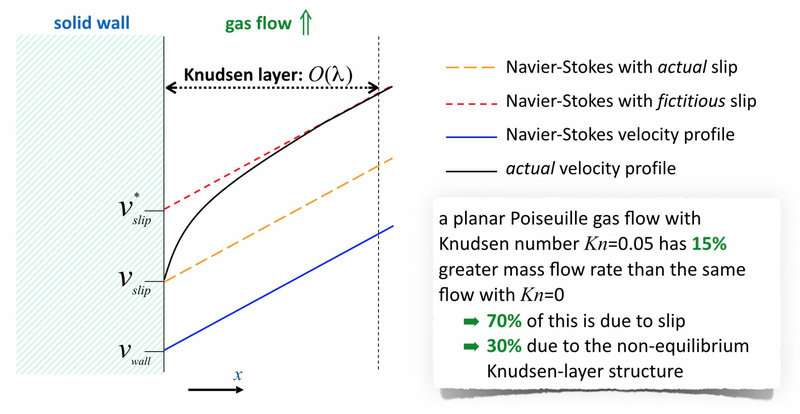 It is the ratio of the measured fluid flowrate to the no-slip Hagen-Poiseuille (pipe) theoretical prediction. 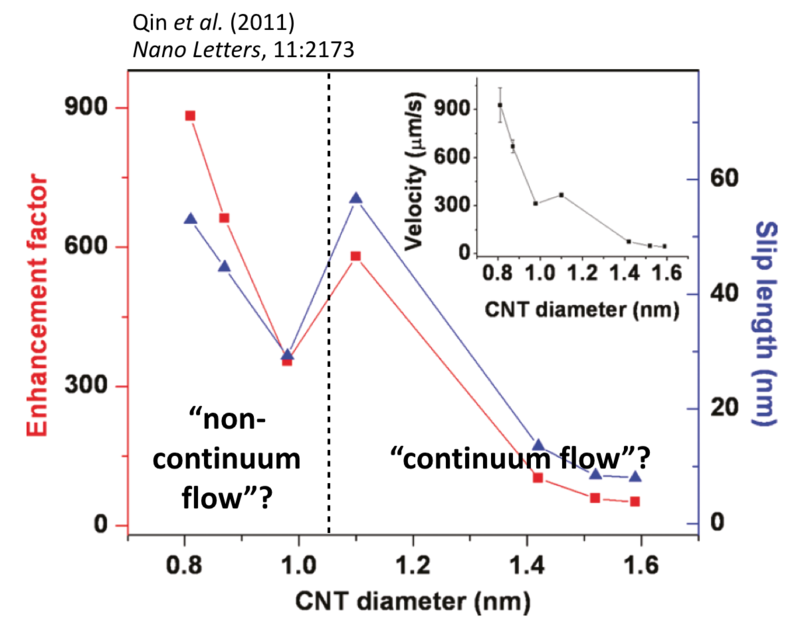 Nanotubes can show enhancement factors of several 100s or 1000s, which indicate how different the non-continuum water flow in the nanotubes is from the flow in a conventional pipe.